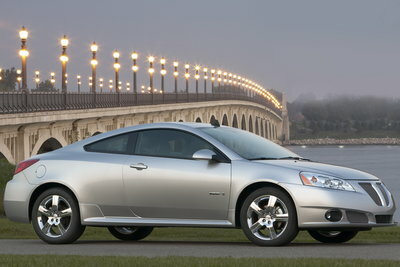 The Pontiac G6 coupe is built on the same front-wheel-drive platform as the G6 sedan. It is offered in two trim levels, GT and GXP. The GT is powered by a 219hp 3.5L V6. A 4-speed automatic is standard. The range-topping GXP features a 3.6L V6 with variable valve timing that produces 252 hp and 251 lb-ft of torque. A 6-speed automatic is equipped with the GXP model.